// Between the lines //: Advent Calendar :: Oh Yes! Advent Calendar :: Oh Yes! Ok, I'm a procrastinator - you knew that already. But I guess that little bit of pressure is what I need to be inventive. You see, yesterday morning, December 1st, we didn't have an advent calendar yet, though the kids had reminded me several times over the last couple of weeks. And yesterday late afternoon, still on December 1st, I was ready to present this calendar to my girls. And they loved it! It's one of those projects again that just happened while I was going. When I started all I knew was that I had to make 50 (well 48 actually) bags somehow, big enough to contain a chocolate coin. The origami paper I intended to use for this purpose was simply too bright (really it hurt our eyes when we opened the package - the prospect of having to actually look at it for nearly a month made us change our mind). I wanted bags, but I wanted them quickly. So then I came up with this idea: making bags from a long sheet of parchment paper folded in two. With pencil, I traced a raster of 4 columns by 12 rows. With the sewing machine I first sewed the columns (I sewed down on either side of the pencil line), then cut the paper along the traced line, to obtain 4 long strips. 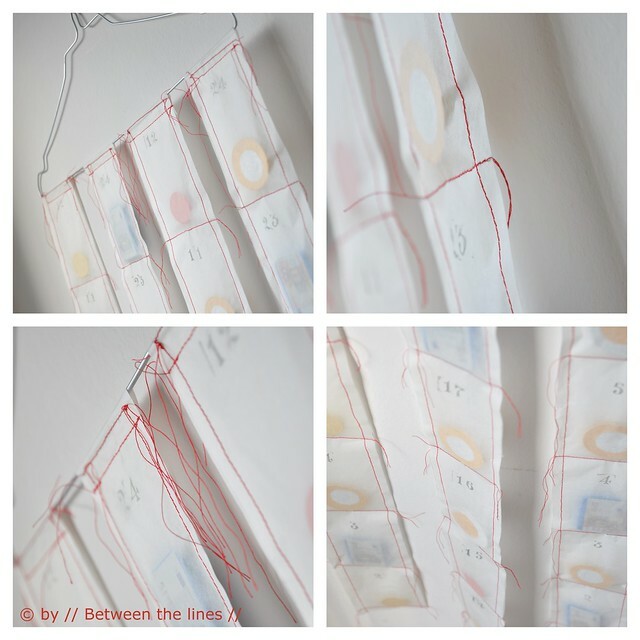 Next, I started inserting coins and as I went, after each coin, I stitched the pocket closed along the horizontal lines I drew in the first step. It was actually fun doing and overall it didn't take that long. I didn't bother about cutting off threads, just left them on hanging. With stamps I printed on the dates. The only thing left was finding a way to hang the strips - and even that didn't take long. I just took another one of those wire coat hangers (I'm running out of them) and sewed the strips onto the hanger,. Now both girls have their advent calendar strips hanging sisterly next to each other, and every night after dinner, they'll cut off the corresponding pocket containing their coin. Et voilà!! Fast, cheap and easy! !